Private spaceflight company SpaceX recovered its Dragon cargo capsule on March 26, 2013. They tweeted this photo and wrote: "[PHOTO] #Dragon returns to Earth pic.twitter.com/7ombMWqfOp"
This story was updated at 12:46 p.m. EDT. An unmanned SpaceX space capsule splashed down in the Pacific Ocean Tuesday (March 26), reaching the wet finish line of the spaceflight company's second cargo delivery flight to the International Space Station for NASA. 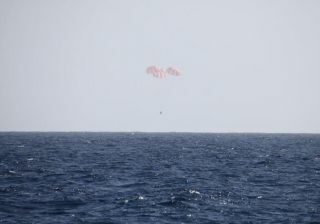 The Dragon space capsule left the space station early Tuesday and, under bright red and white parachutes, splashed into the Pacific at 12:34 p.m. EDT (1634 GMT). The capsule was aimed at a drop zone about 214 miles (344 kilometers) off the coast of Baja California. "At 9:35am PT, Dragon splashed down safely in the Pacific Ocean," SpaceX officials wrote from Twitter. "Welcome home!" "Sad to see the Dragon go," NASA astronaut Tom Marshburn said from inside the station when the capsule undocked. "She performed her job beautifully, now heading back to her lair." Another space station resident wished the spacecraft well upon its departure. "Fly little Dragon, fly, safely home again ro a soft landing in the Pacific," wrote Chris Hadfield of the Canadian Space Agency via his Twitter accound (@Cmdr_Hadfield). SpaceX's founder, Elon Musk, also used his Twitter page (@elonmusk) to send updates about Dragon's progress. "Recovery ship has secured Dragon. Powering down all secondary systems," Musk wrote. "Cargo looks A ok."
This is SpaceX's second of 12 contracted missions as part of a $1.6 billion deal with NASA to fly cargo to the orbiting laboratory. Once Dragon is found and recovered, it will take the team about 30 hours to get the capsule back to shore, NASA officials said in a statement. Dragon's splashdown was originally slated for Monday (March 25), but weather concerns and high seas at its splashdown point prompted NASA and SpaceX officials to delay the undocking. None of the returning experiments should be affected by the one-day delay, NASA officials said. The spacecraft launched toward the space station atop a SpaceX Falcon 9 rocket on March 1 from the firm's launch pad at the Cape Canaveral Air Force Station in Florida to deliver about 1,200 pounds (1,210 kilograms) of equipment, supplies and scientific experiments. Currently, Dragon is the only operating cargo vessel that can bring supplies back to Earth as well as deliver them to astronauts in low-Earth orbit. Russia's Progress spacecraft, Europe's Automated Transfer Vehicles and Japan's H-2 Transfer Vehicles burn up upon re-entry into the planet's atmosphere. SpaceX is one of two private spaceflight companies with a NASA contract for unmanned cargo delivery missions to the International Space Station. The company's next launch is scheduled for the end of September this year. The Virginia-based Orbital Sciences Corp. signed on with the space agency to make eight unmanned flights with its Antares rocket and Cygnus capsule in a deal for $1.9 billion. The Antares rocket's first test flight is scheduled for mid-April. With the retirement of NASA's space shuttle fleet in 2011, the U.S. space agency is currently dependent on Russia's Soyuz spacecraft to ferry astronaut crews to and from the space station. NASA plans to use new private space taxis to launch American astronauts on trips to the space station once they become available. SpaceX is one of four companies currently competing for the NASA crew launch contract. The company is developing a manned version of its Dragon capsule designed to ferry seven astronauts into low-Earth orbit and return them to Earth.